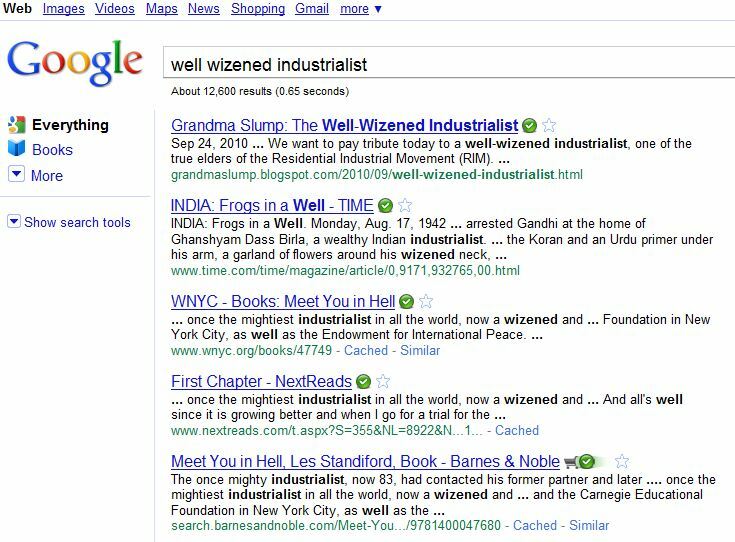 Grandma Slump: I'm #1 In The World With Well-Wizened Industrialist News! I'm #1 In The World With Well-Wizened Industrialist News! Look at that, will you? 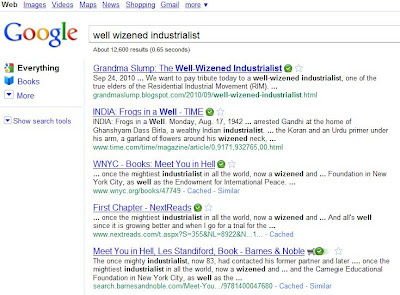 I'm number one in the entire world, according to the famous Google system of indexing web pages! This is impressive. If you look closely, you'll see I beat out a couple of real powerhouses. Time magazine and Barnes and Noble! Huh? Huh? Those guys aren't slouches! Here's the link to the original post. In the post, I profile "Ernie," a member of the Residential Industrial Movement who happens to be very well-wizened. But that doesn't mean he's looking for marriage proposals, so ... if you're so inclined, just forget it. Ernie's a great guy. I told him the world would be reading about him today. He gave me a big old grin. But little did I know he would be Number 1 in the whole world! That's an honor that he does deserve, and I'm happy to have had just a small part in making it happen.